Boubacar Barry saved and scored the crucial penalties that handed Ivory Coast victory over Ghana in the 2015 Africa Cup of Nations final. 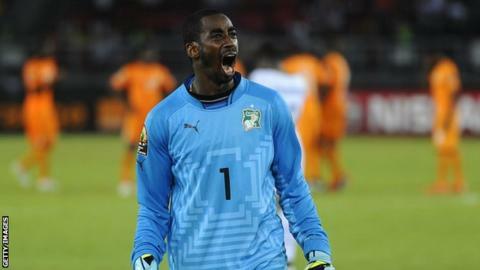 Ivory Coast's Nations Cup winning goalkeeper Boubacar Barry has announced his retirement from football with immediate effect. Barry, whose career lasted for more than two decades, was part of Ivory Coast's 'golden' generation which included the legendary Didier Drogba, Yaya Touré, Kolo Touré and Gervinho amongst others. "On 2 March I announced the end of my career as a goalkeeper which has lasted for 22 years," Barry said in a statement on the website of Belgian second tier side OH Leuven - the club he joined in 2017. "Boubacar 'Copa' Barry became what he is today thanks to the support from people who trusted him and gave him a chance," Barry added, as he thanked those who have supported him during his career. "I have indeed replaced my gloves with a new cap which is coaching. "Thanks to God, I had the chance to join the OHL who have given me the post of a goalkeeper coach. "I wish to express my gratitude for their confidence in me to start my new career with them. I am aware of the weight of the responsibilities and like my predecessors, I will continue to convey the values of universality and courage and team spirit," he added. Goalkeeper Boubacar Barry holds aloft the Cup of Nations trophy following his shootout heroics in the 2015 Africa Cup of Nations final. He featured in Ivory Coast's last group game against Serbia & Montenegro in the 2006 finals in Germany which they won 3-2, and also played in all the Elephants' matches in the 2010 and 2014 finals in South Africa and Brazil respectively.